Confession time: I have never seen Apollo 13. Judging by the results of this poll, that’s something I need to fix ASAP. Possible entry in next year’s 50 movies project…? Other than that, nice to see so many films get votes, including Howard’s latest, Rush. This Week’s Poll: Over the weekend, one of the most anticipated films of the year, Gravity, opened with an October record-breaking $55.8 million. Truly amazing numbers, and better yet, it’s getting overwhelmingly positive reviews (98% on Rotten Tomatoes, 8.8 on IMDB). With such a strong opening, it only seems appropriate to take a look at the man behind the film: Alfonso Cuarón. What is your favorite Alfonso Cuarón film? For a director with just seven full-length films to his name, he sure has an impressive (and diverse) resume. Can’t wait to see the results on this one. Nice question. I haven’t seen Gravity yet, but I voted for Children of Men. Amazing movie I think needs to be seen by more people. Children of Men is a great film. Thanks for voting! You need to get on that and watch Apollo 13, you won’t regret it. Alfonso Cuarón films, I’ve only seen Children of Men, which was alright, but to me a tad over-praised. Have high hopes for Gravity, though! For Cuaron, I recommend checking out Y Tu Mama Tambien. That has been one of the highlights for me in this year’s movie project. Amazing film. I am actually watching Gravity later today and I can’t wait. As for Ron Howard, I voted for the #2 and #3 in the list. I very much like Apollo 13 as well, but now that I look at it, I feel it’s a bit too formulaic and Hollywoodesque for my taste. Still, a very good film, any of the three with most of the votes deserved the top spot. Hope you enjoyed Gravity! I’ll be seeing it over the weekend. Yeah, I think I have dodged Apollo 13 over the years simply because it does seem to be very Hollywood. All of these positive comments have me reconsidering though. Probably a good idea to wait. Based on the unanimous positive reviews, I’m surprised Gravity isn’t winning right now. Seen it today and voted for it. I don’t understand the love for Children of Men – it’s a great movie, but I never thought of it as perfect or near perfect. Awesome! Glad to hear you dug Gravity. You really should watch Apollo 13 its really good. Not surprised to see it top this poll either, its one of my favourites. Actually it was on tv the other night, so I ended up watching it, brilliant! 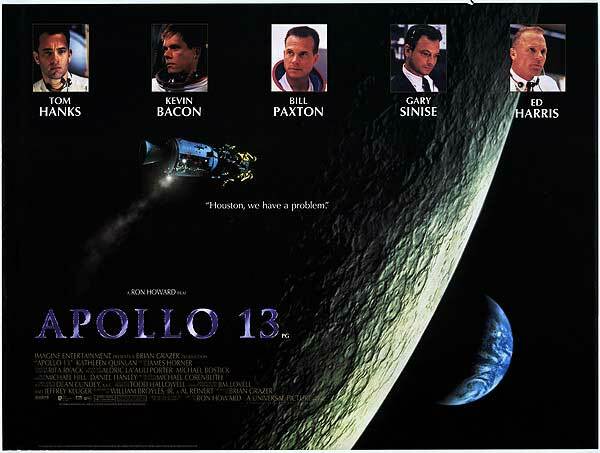 I’m thinking I’ll include Apollo 13 on next year’s project unless I happen to get my hands on it sooner. Looking forward to seeing what I’ve been missing out on! Good to see Apollo 13 won, but had I voted (WOOPS!) it would have been for Frost/Nixon. So damn engrossing. Ahhhh, sorry to hear you guys don’t have Gravity yet! When will it be released over there? A pleasant given with ‘Apollo 13’ winning the poll. It takes an exceptional director to make rapid calculations with slide rules and whiz wheels dramatic and suspenseful! Great dialogue with a minimum of superbly executed special effects. Always great to see Ed Harris, Gary Sinise and Joe Spano share screen time! Hi Jack, I’m looking forward to finally checking out Apollo 13. That cast is awfully intriguing, and I love all of the positive comments it’s getting on here. Haven’t seen Gravity yet, but I’m a big fan of A Little Princess. It has a big heart and is very charming. I’ll have to check out A Little Princess. Haven’t heard much about it actually. Speaking of Gravity, I couldn’t help thinking that it was sort of a technically more impressive made up version of Apollo 13. No doubt Children of Men is my favorite of his films. Interesting. So you weren’t as enamored with Gravity as everyone else? It was a fun watch and be sure to check it out in the best format you can find. However, the story was sort of weak and filled with the sort of symbolism that plagues freshmen creative writing courses. Interesting. It’s good to hear a balanced critique like that — it seems complaints are few and far in between on the internet.